In 2017, the world was meticulously crafted into a beautiful map worthy of your home. This hand-drawn, inspirational map took over three years to produce and depicts our modern world with old-fashioned charm. 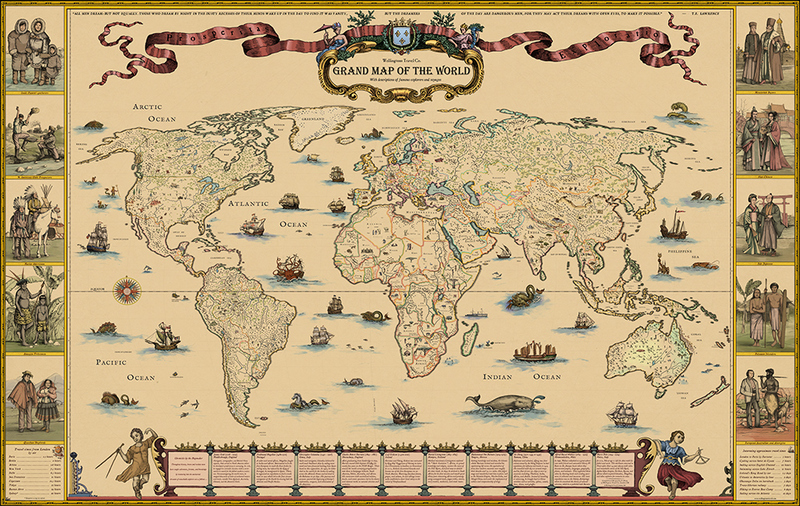 Grand Map of the World accents all the romance and traditions of 17th century maps. Alongside the map are portraits of people from distinct cultures and inspiriting stories of those who journeyed into the unknown in search of adventure, fortune, and knowledge. Contact us for priority delivery rates. Maps are ready for framing but does not come framed. Canvas maps are not stretched and will be shipped in a tube. 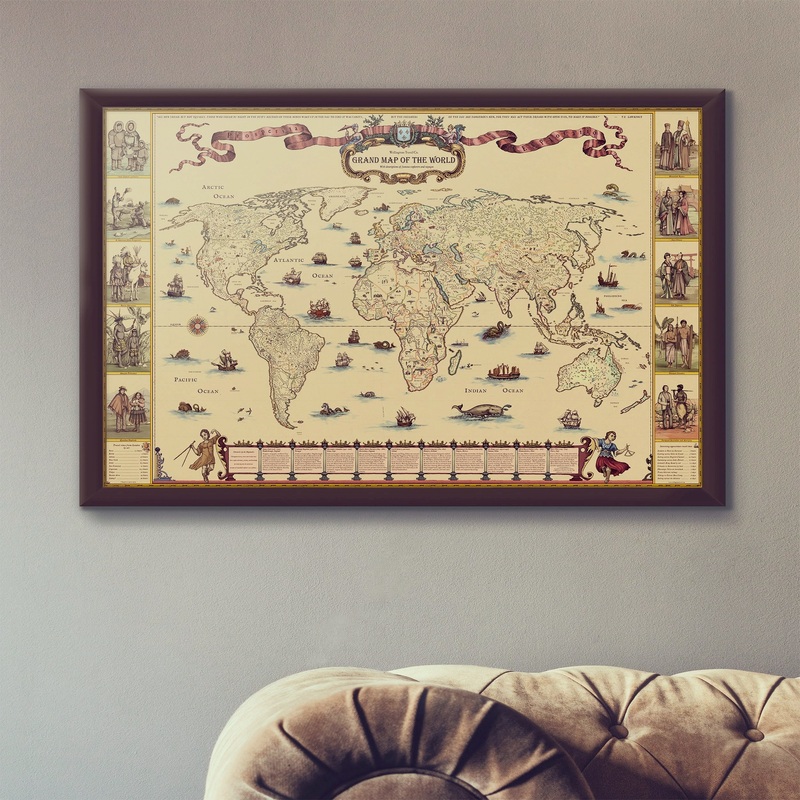 This beautiful vintage 1600s style wall map portrays the six of the seven continents of the world, namely Africa, Asia, Europe, North America, South America, and Australia. 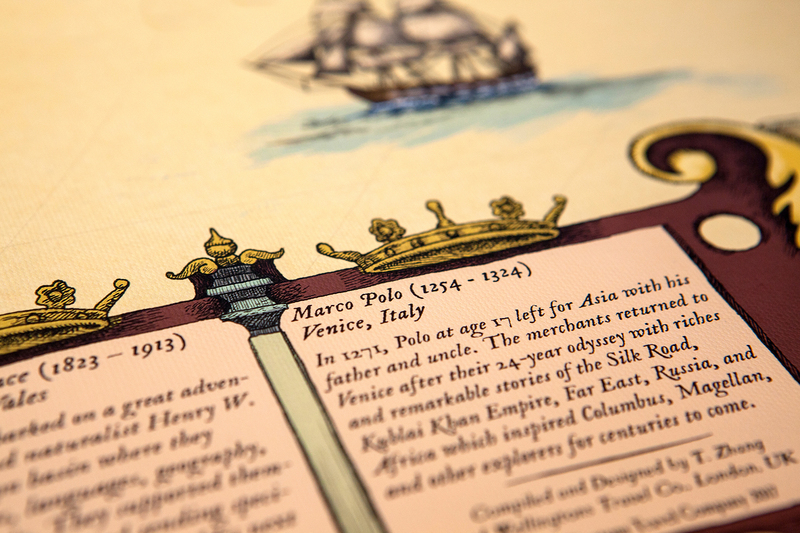 Compiled and designed by Taige Zhang, chief cartographer of Wellingtons Travel, and illustrated by five artists, this rare map is one of the few contemporary maps still made in the historical style, incorporating symbolic and traditional elements of maps from past centuries. Based on the familiar Robinson projection, Grand Map of the World is exceptionally detailed and replete with natural and man-made landmarks, peoples and cultures, wildlife, vegetation, ships, and mythical sea creatures. The side panels depict people in traditional dress from around the world. Since 2011, we have been producing London maps in historic style to enchant those who love history and art. 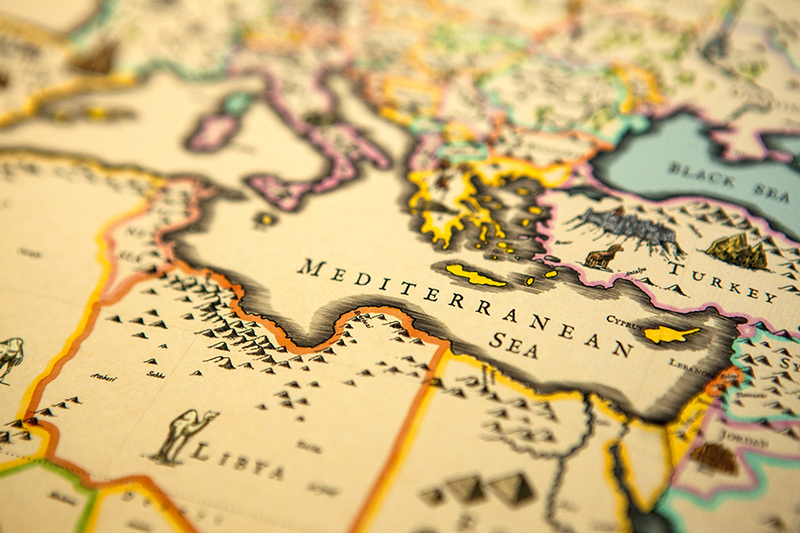 Thousands of maps were sold to customers from over 20 countries; some of our customers have included the City of London, bookshops, galleries, hotels, business executives, celebrities, and students. Our Grand Map of London has been featured in books, magazines, and on the web, including on The Guardian's top 10 hand-drawn maps list. In 2014, we started researching world maps and drafting concepts. After several false starts and setbacks, we were able to find a format, style, and layout we liked. Due to the immense size of the project and diligence required, it took five artists and over two years to complete the final artwork. Elements were often drawn over and over until it was just right. Through the years, we trusted that we could make a world map that we would be proud of and customers would love. In November 2017, the Grand Map of the World was completed. 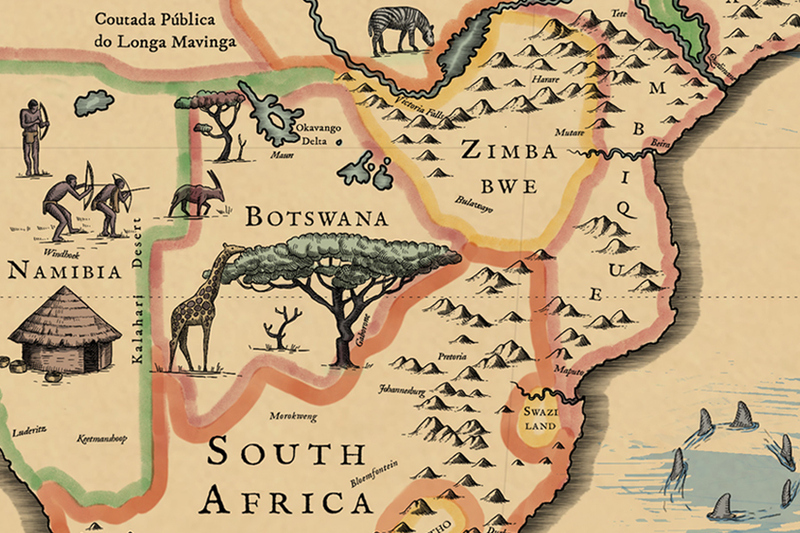 We made this map to inspire those who long to travel and explore the world. Displayed in the home or office, it is a reference, decoration, and source of inspiration. Like a puzzle, it is detailed enough to stir curiosity and compel repeated perusal. This map is for all those who want to be reminded of how immense and incredible our world is. 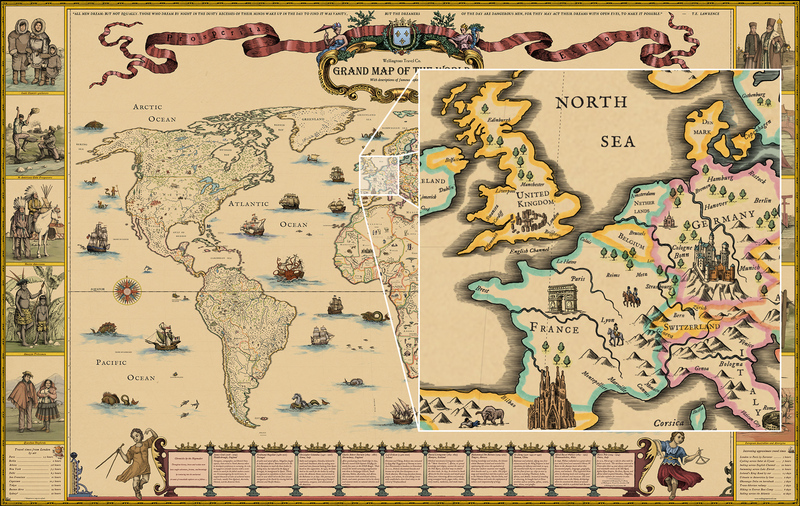 With hints of what one might find in each country, chronicles of the greatest adventurers in history, and interesting travel times, this map is a constant invitation to set off for new lands. We hope this meticulously crafted grand map may serve you well as a gift, ornament, reference, or muse. Interested in corporate gifts, expedited shipping, wholesale, or licensing? Write to us at mapmaker@wellingtonstravel.com. We welcome any questions or comments. In the event you are unsatisfied with your purchase, we will gladly provide a refund. 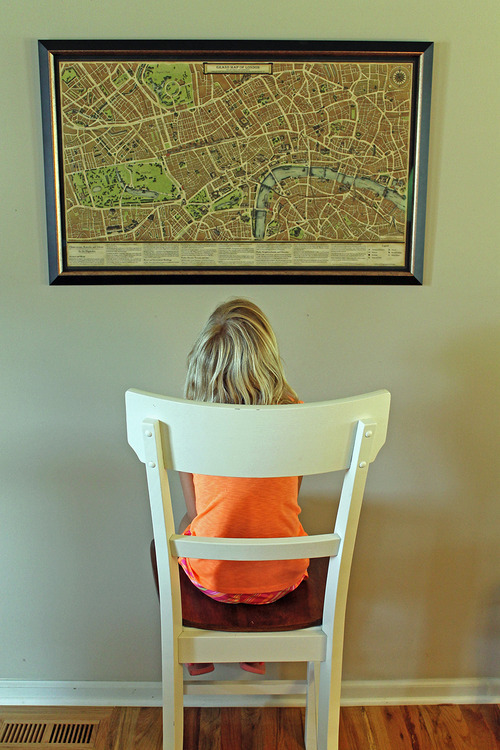 We especially love seeing photos of the map in your home or office. We often share those in our gallery.